Most people are familiar with vertigo when it’s caused by a direct irritation to the equilibrium system in the ear. For example inner ear infections, sinus infections in the mastoid bone (mastoiditis) by the ear, or ear crystals inside the ear (BPPV) can all cause vertigo and vertigo-like symptoms. Unfortunately, if the cause of the vertigo is not directly inside the ear, then many people never actually discover why they had vertigo in the first place. Instead, they must wait for it to subside and hope it never happens again. The five reasons people get vertigo are presented in the video below, including, the problems in the body’s proprioception system (the other big cause for vertigo.) Let’s dive in. You’re going to understand why some vertigo drags on for days or weeks at a time. And why it won’t go away, even with some really good medical care. You’re going to learn five systems you need to check, as well as the two “secret senses” you should understand to find a vertigo solution. and a loss of balance. The brain becomes confused… it tells the body that the earth is moving or the room is spinning, when it’s doing neither. More severe cases may include nausea, vomiting, tinnitus (ringing in the ears), and blurred vision. (Yes tinnitus and motion sickness, and visual disturbances are often a part of vertigo attacks.). Vertigo is not dizziness alone (which can happen for a variety of reasons), but dizziness that occurs repeatedly, often based on repeated changes to the position of the head. Vertigo-like symptoms often come with other health problems, like Meniere’s Disease, migraines, and inner-ear infections. When vertigo is mentioned, many people are talking about BPPV, or Benign Paroxysmal Positional Vertigo (BPPV). According to medicine, BPPV is often caused by calcium deposits in the inner ear shifting when the head moves. These are known as crystals. This causes the body’s nervous system all kinds of problems in maintaining balance. These calcium deposits are known as canalithiasis. In cases where canalithiasis is actually the cause of the vertigo, many patients are helped by a specific treatment for repositioning the calcium crystals in the inner ear, called Epley’s maneuver. But this inner ear system is only one system that needs to be checked. There are four others. Let’s get it into it. Vestibular (called equilibrium from here on out): where you are in gravity/relationship to the ground. Proprioception: where your body is in relationship to space and itself. Equilibrium, proprioception, and vision all play a role in maintaining balance. Confusion in balance is vertigo. The equilibrium parts are mostly in the inner ear. But it has a few pieces that go down into the brain stem. The proprioceptive parts are everywhere – especially in the joints of the neck. A lot of vertigo is blamed on a direct interference to the equilibrium system in the ear. Ear nose the throat doctors will investigate your vertigo as likely from a problem created by one of these three. If your hearing is okay, and you have no obvious infection in the ear, then calcium deposits in the ears will probably be blamed. But here’s where it gets weird, and why you need to check a few other systems. The ear isn’t the only place to look. The equilibrium system gets lots and lots of data from the vision and the proprioceptive system. Especially from the joints in the neck. So, the eye alignment can be off and cause vertigo. Or neck joints can be giving bad information to the balance system. One solution for this is to give the proprioceptive system different data. How do you do that? Certain motions give the balance system a temporary reboot through joint motion. CBS reported about a doctor who is treating vertigo by having patients roll around after placing their heads in funny positions. Another way is to fix the joint irritation (proprioception) that’s giving bad information to the balance system – between the skull, and the first, and the second neck bones. That’s what I do as a chiropractor who works gently, and specifically on the neck. If there’s any question in anybody’s mind if the joint alignment can affect your balance…just rotate your head to the right/left and hold it there for a few minutes then start walking around. After awhile you’ll start to feel a little nausea and unsure of your footing. It’s a good party trick. And it’s a way to prove to yourself that your head and joint position in your upper neck matter to your sense of balance. So, let’s review…in case you missed it, we have covered four out of the five systems you need to check in order to fix vertigo. Plus, there’s a small possibility that a problem in the brain could be causing vertigo issues (probably diagnosed via MRI). That would be the fifth system to check. 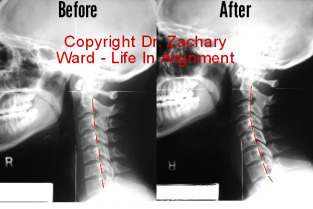 Vertigo and the upper cervical chiropractic correction? Upper cervical corrections take pressure off of the lower brain stem, the upper spinal cord, and the joints by gently moving the top bones of the neck., thereby re-positioning the head in relationship to the neck. Reducing this pressure allows the nerve system (that proprioception system) able to function more efficiently. The upper cervical chiropractor allows the body the chance to naturally reduce vertigo symptoms by correcting the cause—the confused communication between the brain and the body. Even if you have no obvious history of head or neck trauma, there is a chance that your vertigo or BPPV symptoms could be related to an upper cervical misalignment. If addressing calcium deposits in your inner ear has offered little help to you, then addressing head to neck balance could be your next step.